Harnessing GIS is a new quarterly column to help surveyors understand how to put GIS to work. I will demystify popular GIS technology with a hands-on approach so you can supplement your toolbox with some valuable and powerful tools. sri is a major player in the GIS market and, for the CAD professional, has made available a freely downloadable add on called ArcGIS for AutoCAD. It helps address some of the difficulties AutoCAD users have when trying to use ArcGIS data, as well as some of the difficulties ArcGIS users have when trying to use AutoCAD data. It isn’t a fully fledged or seamless way to integrate complex workflows relying on both AutoCAD and ArcGIS products (at least not yet, anyway), but it can provide some valuable options for both types of users. The surveyors who will benefit most from this product are those who rely on GIS data to finalize their drawings and those who are simply curious about what public GIS data may be available as they work through a drawing. If you are a surveyor in a mixed CAD/GIS shop (or at least work with GIS data) and have AutoCAD, AutoCAD Map, or AutoCAD Civil, you can download and use this tool. It works with AutoCAD 2010 and 2011 (both 32 bit and 64 bit). 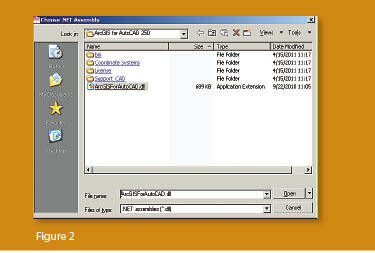 A version is also available for AutoCAD versions 2007 through 2009. It does not support AutoCAD Lt. This review will use “regular” AutoCAD 2010 (Figure 1). From the perspective of the AutoCAD user, this product gives you the ability to connect to live ArcGIS map services, via an internet or internal network connection. A live connection ensures you always have the latest data, and you don’t need to wait for your GIS colleagues to prepare and transfer data to you. In your drawing, you see map services under your CAD entities and can load as many as you wish, turning each on and off as needed. 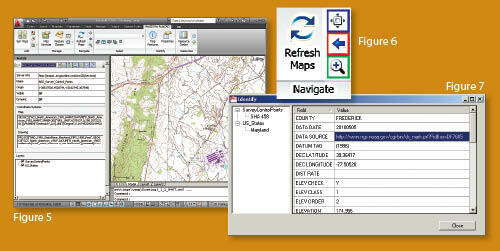 Many map services can be identified (you click on a GIS feature in the map service and get back a pop-up window of attributes that you can copy). Imagine loading a map service of NGS survey control points and being able to click on one and return a link to the data sheet! There is really no limit to what kind of data you can add to your drawing, provided someone has published it for you and made it available through ArcGIS Server. This includes shapefiles, geodatabases, and images. If you have been provided shapefiles or geodatabases, you can use those directly in AutoCAD Map or Civil using native AutoDesk functionality. Common data that may be of interest includes satellite images, orthos, topo quads, survey control points, land use, center lines, or any other kind of GIS infrastructure that had been shared via ArcGIS Server. Many agencies (particularly departments of transportation) are using ArcGIS Server to provide data layers to contract surveyors. Also, if your organization has ArcGIS Server in the GIS department, any data supported by ArcGIS can be shared live with AutoCAD users. CAD.dll file in the window that pops up, and click Open (Figure 2). Note: you can use the acad.lsp file or set up a script to get it to open automatically (examples of both are provided in the ArcGIS for AutoCAD help). Activate the ArcGIS for AutoCAD tab on the ribbon. From the Add section, click the Add Map button (marked in red in Figure 3). services/ and the Map Name is TNM_Digital_Raster_Graphics. To follow along, repeat step two with this information. The survey control points and USGS quad maps will be requested and drawn in your drawing. Because I want to start a drawing of a location in Maryland, my screen looks like Figure 5. From the information on the left, you can see my drawing is in local state plane coordinates, and the survey control is in geographic coordinates. Because ArcGIS for AutoCAD requests the data in the coordinate system of my drawing, the GIS data is overlaid in the proper location, even though it is stored back in ArcGIS in geographic coordinates. You use the Zoom Extents (shown in blue in Figure 6), Zoom Previous (show in red) or Zoom Box (shown in green) buttons on the Navigate section of the ArcGIS for AutoCAD tab of the ribbon to adjust what gets drawn. Or you can use your regular View tools within AutoCAD. If you use any of the AutoCAD View commands, you may need to use the Refresh Maps button on the ArcGIS for AutoCAD ribbon to render any missing parts of the map services you have loaded. Finally, here’s how to use the Identify section of the ribbon. Click Map Features and define a box around a feature to return attributes in a pop-up window. Press the Ctrl and C buttons together over a highlighted value to copy it. In this case it is the data source URL, which you can paste into your browser to see the NGS datasheet associated with the control point (Figure 7). That’s the basics! There is a bit more to it, but reading the help section can give you the scoop. I hope you see how valuable it can be and are inspired to try it out. If you can’t immediately think of someone who has an ArcGIS Server for you to connect to, I’ve listed some common ones below for you to try out. 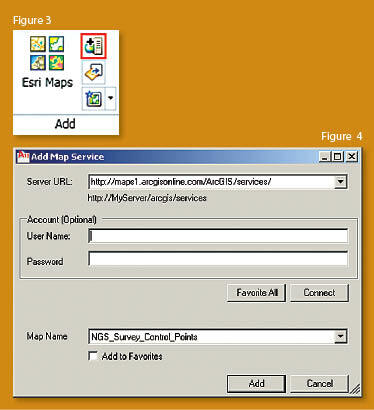 Below are some publicly available ArcGIS Servers that contain map services that surveyors might want to add to AutoCAD. For each map service I have listed both the Map Name and the Server URL. services/ into your browser. Be sure to check with the host of each map service you want to use to determine any copyright or usage restrictions. Visit www.esri.com/autocad to download it, to get answers to common questions, and to watch videos of the product in action. And let me know what you think. If you have anything you’d like to share with me about this product review or anything else related to GIS technology for CAD users, I can be reached at ray@profsurv.com. Ray Carnes, BinfTech., stumbled across GIS in 1992 and has used it ever since for managing data and modeling and analyzing geographic features. He also helps surveyors overcome the GIS learning curve and works with them to get GIS running in ways that complement their work. He has spent nearly 20 years (10 with Esri) providing GIS and IT support, training, implementation, and development services.